Details of the August visit have been confirmed this morning. THE FULL SCHEDULE for the visit of Pope Francis to Ireland later this summer has been confirmed this morning. The leader of the Catholic Church will spend two full days in the country on 25 and 26 August. 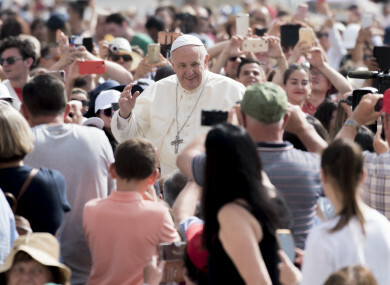 The main events of the visit were already known – including the Pope’s speech at the World Meeting of Families in Dublin’s Croke Park on Saturday 25 August and his mass the following day at the Phoenix Park. The full details of his planned visit to Knock in Co Mayo (Sunday) and to the Capuchin Day Centre for homeless families (Saturday evening) were also announced today. Archbishop Eamon Martin, the leader of the Catholic Church in Ireland, and Archbishop Diarmuid Martin of Dublin announced the schedule and took questions from members of the media in Maynooth this morning. The government also set up its official website for the visit and urged anyone interested in attending the two main public events at the Phoenix Park or at Knock to make sure they had tickets before planning their journeys (more details below). More information on how to get tickets for the main pubic events is available at the new government website (www.gov.ie/popeinireland). 500,000 tickets will be made available for the Phoenix Park mass, while 45,000 is the site capacity at Knock. “While disruption is unavoidable for a visit of this scale, the Government is aiming to ensure that any disruption to businesses and individuals due to the visit is minimised as much as possible,” a Government press release said. “Necessary alternative arrangements are being developed and will be communicated to those impacted well in advance. Email “500,000 tickets allocated for Pope's mass as full Irish schedule is confirmed”. Feedback on “500,000 tickets allocated for Pope's mass as full Irish schedule is confirmed”.